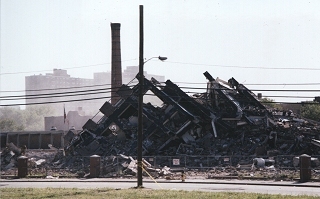 This photo was taken the morning of December 11, 1999 immediately after the Senior Center implosion at the Hayes Homes project. It shows buildings #5 and #7 as they were before demolition work began. These two buildings are the ones in the back row in the remainder of our photos. To see the implosion photos in motion, Click Here. Although we missed going to the Phase I implosion at Stella Wright, we were able to get these photos of the debris the morning of the Phase II implosion.